The trachea and esophagus run next to each other through the chest cavity. The esophagus connects to the stomach, and carries food and saliva to the stomach. 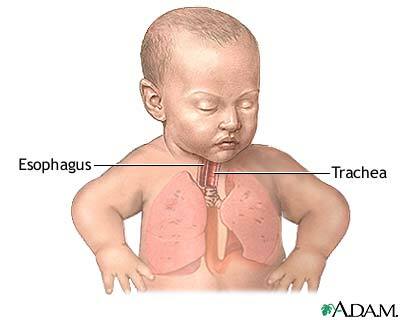 The trachea connects to the lungs and carries air to the lungs. Updated by: Kimberly G. Lee, MD, MSc, IBCLC, Associate Professor of Pediatrics, Division of Neonatology, Medical University of South Carolina, Charleston, SC. Review provided by VeriMed Healthcare Network. Also reviewed by David Zieve, MD, MHA, Medical Director, Brenda Conaway, Editorial Director, and the A.D.A.M. Editorial team.